But there was another rally hardly covered by the media, which was much bigger than any single protest march that is occuring right now. On June 5 a leading national pastor called upon evangelical Christians and others to rally in front of the Brazilian Congress, the presidential palace and the high court to show their support of freedom of expression, freedom of religion, life, and traditional marriage. I expected to see a few thousand fellow believers. To my amazement, as I made my way toward the open-air stage area, I observed streams and streams of men, women, youth, and children moving in the same direction. Dozens of busses that had come from other parts of Brazil were parked nearby. 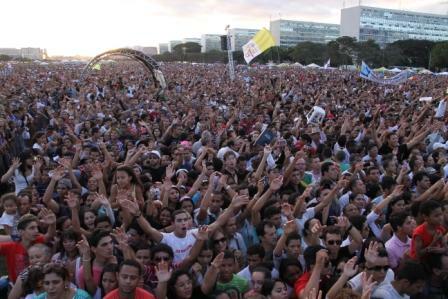 Later, in the midst of speeches, cheers, singing, and presentations by Brazilian recording artists, the announcement came: Seventy thousand of us were gathered to make the voice of Biblical Christianity heard at the door front of the executive, legislative, and judicial powers of the nation. The word was spoken, in John the Baptist style, against some elements in the government, including the current administration, that is promoting legalized abortion and homosexual marriage, and limiting the free speech and religious expression of those against these proposed measures. It was enthralling to see the church gathered in prophetic voice. Bishops, superintendents, pastors and lay public leadersof many denominations spoke with clear, strong and articulate voice over a mega sound system that could be heard for a mile. Pray for the Church and the people of Brazil as they make known their voice. May there be deep and lasting change for the good of the nation. May the Church be salt and light, announcing the Good News and pointing all to the Savior, Jesus Christ and His eternal kingdom. May the corrupted worldview of many in the media, higher education, and government be routed out and overcome with the goodness, truth, beauty and dignity of the Biblical worldview. Praise God the Brazilian Church is leading the way! Wow! How exciting to have TRUTH being spoken so freely! May God bless Brazil! Praise God for the boldness he has given Brazillian Christians! We should follow their lead in standing up for Christ!